To measure the time you need a ticker: something that "clicks" at regular intervals, isn't easily upset, and works the same everywhere. Pendulums are good tickers. The time it takes them to complete a swing back and forth depends on their length and the force of gravity, and only very slightly on the width of the swing — nothing else. The problem is that their length can vary over time and the strength of gravity over the surface of the Earth, so pendulum clocks aren't as accurate as we'd like. where is time, is the length of the pendulum and is acceleration due to gravity. You can find out more about pendulum maths here. Better tickers are quartz crystals which, using electricity, can be made to vibrate like tuning forks. 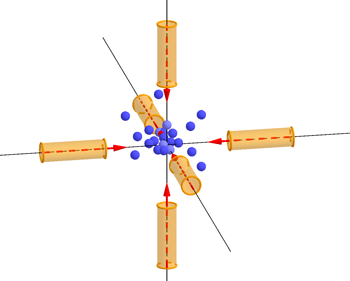 The frequency of their vibration is more reliable than that of pendulums, but since no two quartz crystals are exactly the same, even when they have been machined, and since the crystals are also sensitive to temperature changes, quartz clocks also aren't as accurate as scientists and engineers would like for their most sophisticated applications. The best tickers are atoms. Two atoms of the same kind behave in exactly the same way, always and everywhere. This isn't an obvious fact, but our best physical theories predict it and no experiment has ever proved it false. Clocks that use atoms are accurate to one second in 300 million years. But they are not easy to maintain. To function, the atoms need to be kept at an incredibly low temperature, as near to absolute zero as possible. Strangely, the cooling is achieved by shining laser light on the atoms — not what you'd expect since usually things you a shine a light on get hot. The physicist Bill Phillips received the 1997 Nobel prize in physics for his work on cooling, and trapping, atoms using lasers. We met him at the Heidelberg Laureate Forum (HLF) 2018, where he explained the basics to a riveted audience of young researchers and gave us interview (which you can watch in the video below). "Every atom [comes with] certain energy levels," explains Phillips. "[These] energy levels are very specific and they are the same for every atom of the same kind. One of the ways of [making an atom] go from one energy level to another is to put in light, or microwaves, or radio waves, at exactly the right frequency. That's the key." 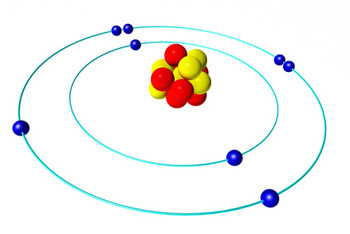 An illustration of the solar system model of the atom. To understand what Phillips means, think of the solar system model of the atom, which has electrons orbiting the nucleus of an atom, just like planets orbit a sun. Naively you would think that an electron can orbit the nucleus at any distance, but quantum mechanics tells us that it can't: only certain distances are allowed. The distances are related to the energy of the electron. When an electron loses energy it moves closer to the nucleus and when it gains energy it moves further away. And because not all distances are allowed, the electron doesn't gradually inch closer when it loses energy, but performs a leap to the next allowed distance. The lost energy is emitted in the form of electromagnetic radiation, that is, light waves or microwaves. As all waves, the radiation released has a certain frequency, which can be measured. So rather than measuring time in terms of the frequency of a pendulum's swing or a quartz crystal's vibration, we can measure it in terms of the frequency of the radiation emitted by an electron changing energy levels inside an atom. To build a clock that uses this definition of a second, you need to measure the frequency associated to the caesium atoms. This is done by bombarding the atoms with microwaves. As Phillips explained above, the microwaves can cause the electrons to change energy level, but only if the frequency of the microwaves is just right. By seeing how many electrons change energy level, the frequency resulting from the electrons' quantum leaps can be established. Why do atomic clocks need to be cold? At the microscopic level, temperature is related to the speed at which atoms move: fast-moving atoms result in a higher temperature than slow-moving ones. 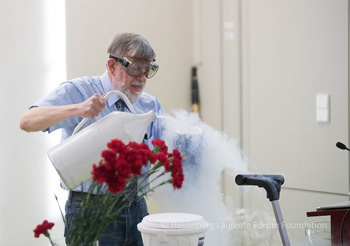 Bill Phillips playing with liquid nitrogen in his lecture at the HLF 2018. Liquid nitrogen can instantly freeze flowers, but it's not cold enough for atomic clocks. Don't try it at home! Photo: Bernhard Kreutzer for HLF, © Bernhard Kreutzer. "The faster the atoms are going, the harder it is to measure them," says Phillips. "For one thing [they] don't stay very long in your apparatus, and it's not easy to measure something when you don't have very long to measure it. The other thing is that there are shifts in the frequency." Phillips is referring to the familiar Doppler shift. Imagine you're standing on the beach with gentle waves lapping at your feet. The waves will be coming at you with a particular frequency, say one every 10 seconds. If you start running into the sea, the waves will hit you in a more rapid succession, so their frequency will seem increased to you. If you run back to the beach, the waves will hit you less often, appearing to have a lower frequency. The Doppler effect comes into play whenever the observer of a wave and the source emitting a wave move at different speeds (find out more here). Atoms experience the effect too. The frequency they "detect" in microwaves depends on how the atoms are moving with respect to the waves. Effects from more advanced physics also impact on the frequency measurements an atomic clock needs to make. One is time dilation, as predicted by Einstein's theory of relativity, and another is Heisenberg's uncertainty principle from quantum mechanics. We won't get into the details here; you can find out more about time dilation in this article and about the uncertainty principle in this article. To minimise these unwanted effects, it helps to slow the atoms down, in other words, to cool them. The temperature at which the motion of atoms comes to a minimum is called absolute zero: it's 0 degrees on the Kelvin scale for measuring temperature, and -273.15 degrees on the Celsius scale. Atoms don't come to a complete stop at absolute zero — quantum effects mean that they are never totally still — but the motion is minimal. Ideally, we'd like an atomic clock to be cooled to as near to absolute zero as possible. Simply sticking the atoms into a super-powerful refrigerator won't work, however. The gas containing the atoms would condense on the walls of the refrigerating container, and for atomic clocks, that's no good. What's needed is a way of cooling the atoms without anything touching them. This is where laser cooling comes in. "We cool the atoms with lasers, which seems like a crazy idea because typically when we shine light at something it gets hot, rather than cold," says Phillips. "But the thing to remember is that the idea of temperature has to with the motion of the atoms and molecules that make up whatever it is we're measuring the temperature of. If we have a gas, which is what we are dealing with in my laboratory, it means you have atoms going every which way. You can shine light on the atoms, and the light pushes on the atoms in such a way that they slow down." Simply shining light from one (or even more) directions at a bunch of atoms moving all over the place won't do the trick. If an atoms happens to meet a light beam head-on, you might hope it'll be slowed by the beam, but an atom moving in the opposite direction might get a push and speed up. Atoms being trapped and slowed in the "optical molasses" created by six laser beams. The key fact is that light can only exert a force on an atom if it is absorbed — and caesium atoms preferentially absorb light from the violet part of the spectrum, which has a frequency of about 1015 Hz. "What we do is tune the frequency of the light to be a little bit lower than the exact frequency that the atoms would like to absorb. If the atoms were at rest, then that would mean that they wouldn't absorb very much. But when the atom is moving [towards the light], there's a Doppler shift which makes it appear to the atom as if the light that is shining on it has an higher frequency; which is to say closer to the frequency that it wants to absorb." The idea is that those atoms that meet the laser beam head-on will slow down, while others will hardly be affected. "This is the clever trick that came from [David J. Wineland, Hans Georg Dehmelt, Theodor W. Hänsch and Arthur Leonard Schawlow], who came up with the idea of laser cooling back in 1975, and we have been using that trick ever since. One laser cooling method using this trick has been dubbed "optical molasses" because atoms find it really hard to through the light created by six lasers. Phillips and others have used this idea as a basis for methods that can cool caesium atoms down to about one billionth of a degree above absolute zero. The best caesium atomic clocks are accurate to one part in 1016, which means that after 300 million years have elapsed they will still not have slipped by more than a second. "We have clocks that are even better than that, but they're not caesium," says Phillips. "So eventually we may change the definition of the second to take advantage of those better clocks." Why do we need to keep time so accurately? One application that does need very accurate time keeping is the global positioning system (GPS). The system pin-points your location by working out your distance to several GPS satellites. Each satellite sends out signals encoding the current time. When a GPS device picks up such a signal, it compares the broadcast time with the current time, which tells it how long the signal took to get to it, and therefore how far the satellite in question is away (you can find out more here). "The clocks that are in the satellites of the GPS are not laser cooled clocks, or at least not yet," says Phillips. "But they are controlled from the ground by laser cooled clocks. It's really convenient to have clocks on the ground that you don't have to worry about; they're just so good." That's a practical application of atomic clocks, but there are also scientific ones. "We use them to study really fundamental questions, like 'is Einstein's theory of general relativity correct?' or 'Are the constants of nature really constant?' These [questions] we can explore using very good atomic clocks." For everyday use at home, a beautiful grandfather clock is still more than sufficient. But to use your satnav and all sorts of other devices the future may bring and to probe the frontiers of science atomic clocks are the way to go. Marianne Freiberger is Editor of Plus. She interviewed Bill Phillips at the Heidelberg Laureate Forum in September 2018.